This month Wa Lone and Kyaw Soe Oo, two Reuters journalists jailed in Myanmar, had appeals against their sentences rejected, according to economist.com. Both were investigating their government’s campaign of violent repression of the country’s Rohingya minority, and both were given seven-year terms for violating the Official Secrets Act—a colonial-era law that allows any government information to be classified as an official secret. These reporters were sadly just the most recent examples of a disturbing trend. Last year 251 journalists languished in jails as a result of just doing their jobs, according to the Committee to Protect Journalists (CPJ), a New York-based NGO. 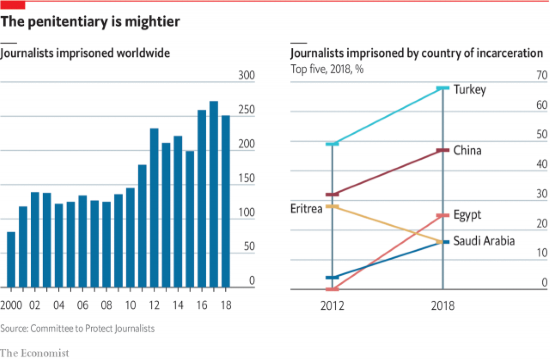 It marked the third year in which at least 250 journalists were imprisoned around the world, though it was also the first decline since 2015. The most censorious governments follow a familiar pattern of suppressing the media and locking up dissenters. Turkey, China, Egypt, Eritrea and Saudi Arabia accounted for 70% of all reporters that were imprisoned last year, mostly for infractions against the regime. Of the 172 reporters being imprisoned in those countries, 163 were detained without charge or for offences classified as “anti-state”. From 2000 to 2012 the CPJ recorded a steady increase in the numbers of news staff behind bars, rising from less than 100 to over 230.